Kasunjith Satanarachchi Devesurenda is the first person with disability from Asia and the Pacific region to participate during the 8th Annual Youth Forum of the UN Economic and Social Council (ECOSOC) in New York. Kasunjith travelled to the United Nations headquarters as part of Sri Lanka’s youth delegation to take part in discussions on advancing the 2030 Agenda for Sustainable Development. 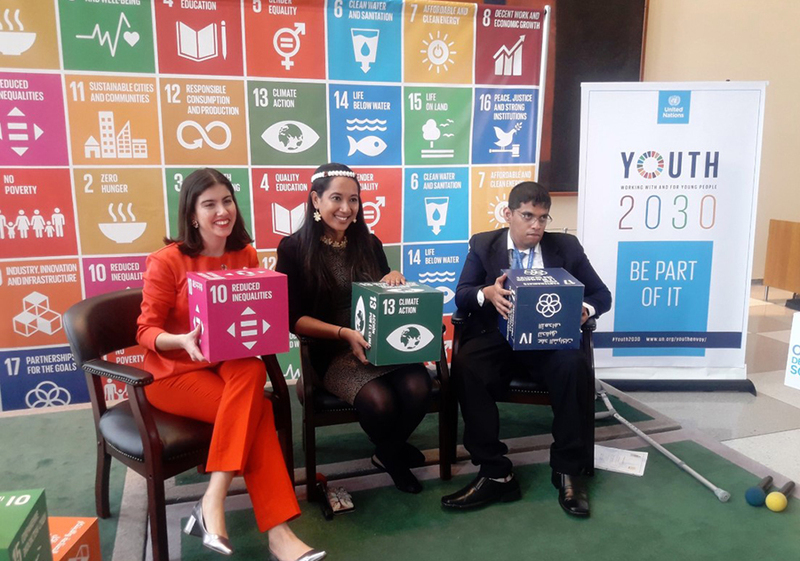 UN Youth Volunteer delegate at the UN ECOSOC Youth Forum, Kasunjith Geemitha Satanarachchi (Sri Lanka) was the moderator at the SDG Media Zone panel discussion on 'Act Now for a Sustainable Future'. The Media Zone serves as a dynamic platform to amplify youth voices & spur action on the 2030 Agenda. The theme for this year’s Forum was "Youth: Empowered, Included and Equal. It provided a great platform for young leaders from around the world to engage in dialogue among themselves and with Member States on advancing the 2030 Agenda for Sustainable Development. UNV and partners are working together to ensure inclusion for young professionals with disabilities. To this end, Kasunjith was approached by the organizers of the Forum to be the moderator at the SDG Media Zone panel discussion Act Now for a Sustainable Future. The Media Zone served as a dynamic platform to amplify youth voices and spur action on the 2030 Agenda. "This was the first time I ever moderated a session. It was a very exciting opportunity, especially because I had eminent panellist who really inspired me to act now or never," Kasunjith shares. UNV Deputy Executive Coordinator Toily Kurbanov participated in a discussion hosted by H.E. Inga Rhonda King, President of ECOSOC, explaining UNV’s engagement with young people as volunteers in the UN system. He expressed the need for governments to work on enabling environments for volunteering through different measures, as well as encouraging everyone to be involved in online Plan of Action consultations on reimagining youth volunteering for the 2030 Agenda. Kasunjith is currently a UN Youth Volunteer serving as UNDP Youth Lead for Sri Lanka Country Office. His area of work is mainly focused on mapping the disability sector, accessibility of the UN Compound in Colombo and working with the Governance and Peacebuilding portfolio of UNDP. He was the first person to be recruited under the UNDP/UNV talent programme for young professional with disabilities. He has published an article on his experience: The sky is the limit: UN Volunteers with disabilities create more inclusive workplaces.